The Canon RS-60E3 2.5mm Sub-Mini Intervalometer Remote Controller is a remote system that connects to certain Canon cameras via a sub mini connection. You can autofocus with it, lock it down when shooting in Bulb mode, or set a variety of intervals for time-lapse photography. See our Notes tab for a full list of compatible cameras. This is an Aputure brand remote that replaces the Canon RS 60-E3. It behaves the same. Please note that you can shoot 1-99 shutter counts or infinity shutter counts. This is important because if you want to shoot for 2-3 hours but can't return to your setup in that time, your only choices are to shoot only up to 99 shots or let the camera shoot on infinity mode until you return or the battery dies. Plan accordingly. 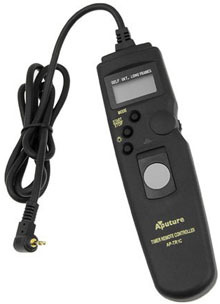 • This is an Aputure brand remote that replaces the Canon RS 60-E3. It behaves the same. • This remote takes a CR2032 lithium battery and is included. However, the life of the battery is not guaranteed. Keep your own spare on-hand. • This remote is compatible with any DSLR with a 2.5mm (3/32") sub mini phone input, which is not to be confused with the much more common 3.5mm (1/8") mini phone input. There are adapters that will allow you to connect 2.5mm sub mini phone devices to 3.5mm mini phone ports but experiment at your own risk. Again, may be compatible with a camera not on this list that has a sub mini phone port but experiment at your own risk.